Instantly plates copper onto iron, steel, brass, bronze and solders without heat or electricity. Prevents tarnish on brass, bronze and copper. Perfect for jewellery sample lines and museum bronzes. Plates pure silver onto copper, brass, bronze and silver without heat or electricity. Produces a dark, black antique finish on silver and gold. Prepare and clean the surface to be treated. 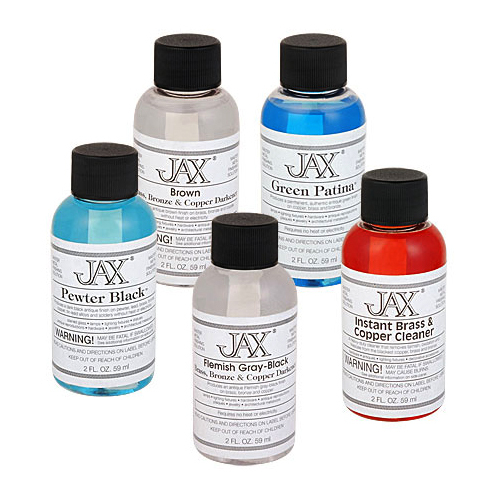 Apply the JAX Silver Blackener. Wash the JAX off the metal when the metal is slightly darker than your desired finish. Produces a permanent, authentic green finish on copper, brass and bronze. Produces a simulated 24K gold finish on brass. Brush or dip into solution. Which speed with which bit?